You may have heard that researchers discovered a new species of flying squirrel. These squirrels had lived in plain sight for decades but only recently did Brian Arbogast and colleagues investigate the DNA of some of these animals. Their findings were revealing: The Pacific squirrels cluster separately from the northern and southern flying squirrel. The researchers analyzed mitochondrial DNA as well as microsatellite data to reveal this new evolutionary relationship. Note: Mitochondrial DNA and microsatellites are parts of a species’ genome that are regularly used to construct evolutionary trees. In addition to the DNA in every cell’s nucleus in our body, mitochondria, the energy powerhouses in our cells, have their own genome. This mitochondrial genome is relatively small, is inherited from the mother only and has relatively high mutation rates. It is like a small clonal lineage within an organism which makes it ideal for evolutionary studies. Microsatellites are short sequence repeats in the nuclear genome that do not produce proteins. Thus they are free to mutate at a higher rate than coding sequences – mutations will not mess up protein production- and they frequently vary in length and thus reveal relationships among organisms. A few weeks ago, before this study was published, 2 species of flying squirrels were considered to exist in North America, the northern and the southern flying squirrel. Here in Ohio the northern flying squirrels is resident – it is nocturnal though, that’s why you probably have not seen one yet. 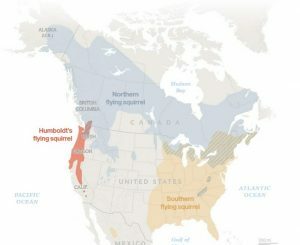 DNA analysis showed that the coastal squirrels in Washington and Oregon are distinct from their northerly relatives and that they actually only co-occur with them at 3 sites in the Pacific Northwest. 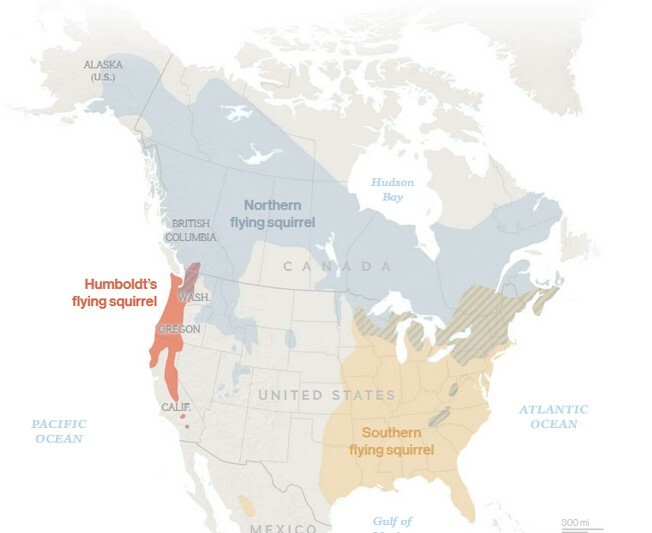 Northern and the newly described Humboldt’s flying squirrel do not interbreed at these sites. By the way, the researchers named the new species Glaucomys oregonensis because the specimen that was used to describe the species was collected in Oregon. You may recall from a previous post, that Dr. Andreas Chavez in our department of EEOB studies relationships among squirrels in a different genus, Tamiasciurus, the red squirrel T. hudsonicus and the Douglas squirrel T. douglasii. These two species share habitat in the Pacific Northwest and they do hybridize. Dr. Chavez was not available for an interview for his thoughts on the new species description of flying squirrels, because he is currently pursuing his own fieldwork in the Pacific Northwest. He and his field assistant Stephanie Malinich are collecting data to better understand the hybrid zone dynamics between the Douglas and red squirrel. We will give you an update on Dr. Chavez’ research once he returns. 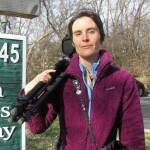 About the Author: Angelika Nelson is the curator of the Borror Laboratory of Bioacoustics and writing this post for Stephanie Malinich, collection manager of the tetrapods collection. Stephanie is currently doing fieldwork on the red and the Douglas squirrel in the Pacific Northwest. When you think of bringing back a species that is extinct, you may picture a huge Woolly Mammoth or a giant Tyrannosaurus rex. 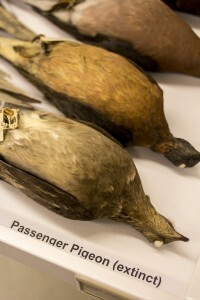 But have you ever pictured bringing back a plump, dove-like bird, the Passenger Pigeon? It seems a highly unlikely candidate for the de-extinct research being conducted by Long Now Foundation’s Revive & Restore. This group of geneticists are working on what they call genetic rescue, to both save highly endangered species and bring back extinct species. But what role do museums play in the de-extinction of a species that died out in 1914? Imagine a sky darkened for hours because a cloud of birds are passing through a town on the way to their roosting spot. Though an amazing sight to behold these birds were actually quite damaging to the forests they used as a roost. Branches would break under the weight of nests and birds. Feces would cover the trees and ground and cause a rise in acidity in the soil. Scientists Ellsworth and McComb (2003) suggested that about 8% of the forests within the pigeons’ breeding area were damaged annually. While all this sounds terrible for the forest, the birds were also aiding in the creation of a healthier forest. How? The damage they caused to the forest canopy, allowed more light to enter the forest. The feces they produced would actually add some nutrients to the forest floor creating nutrient rich soil. In addition, their main food source, various nuts from oaks and beeches, were able to spread throughout the Passenger Pigeon’s breeding range creating some of the various forest we walk through today. 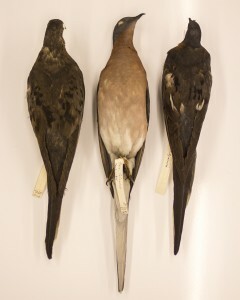 Revive & Restore’s overall goal in de-extinction of the Passenger Pigeon is to fill the lost forest disturbance niche that the pigeon’s extinction caused. Researchers debate that by bringing back the pigeons the need for human managed forest fires or disruptions will be decreased. They hope to create more natural forest regeneration via the pigeon’s destructive behavior. Museums, like vast libraries of natural history, hold the key for groups like Revive & Restore. 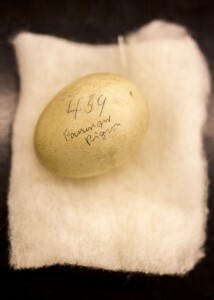 Museum collections, such as the Tetrapod Collection here at OSU, are the final resting places for extinct species. Study skins hold the genetic material that researchers need to understand what genetic components are necessary to bring back or understand the evolution of a species. It is part of our mission to make sure that these species are understood not just in terms of location and date but also in terms of their genetic makeup or DNA. Using museum specimens for DNA sequencing of extinct species is not a new topic, in fact, it became popular in 1984 with examining dried quagga muscle tissue. Researchers then used this technique to confirm that the quagga, an extinct member of the horse family, really was as closely related to today’s horse as fossils suggested. Now researchers are looking at using Passenger Pigeon study skins to create a full genome of the species to better understand both its evolution and how to bring it back to today’s skies. Be sure to check out the Tetrapod Collection’s campaign and help us purchase a new mobile cabinet for the extinct species in our collection. Our goal is to raise $5,500 and to educate people, about tetrapods throughout the month of October. Be sure to check out our videos, social media, blog and campaign page! About the Author: Stephanie Malinich is collection manager of the OSU tetrapods at the Museum of Biological Diversity.